A disabled man who took his legal fight over cuts to his care to the Court of Appeal has had his case dismissed. Luke Davey, 41, challenged a ruling upholding Oxfordshire County Council's decision to cut his package by 42%. 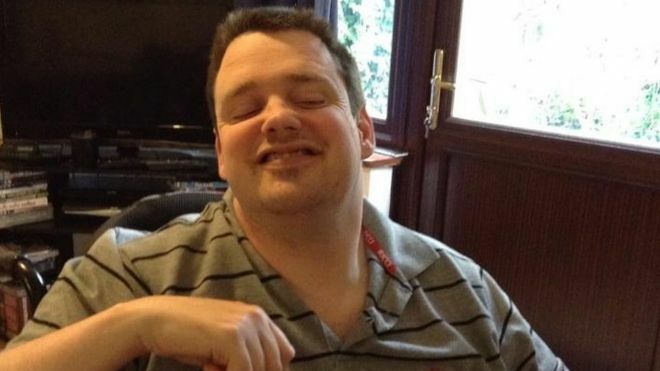 Mr Davey, who has quadriplegic cerebral palsy, argued it threatened his well-being and breached the Care Act. Campaigners said the case could have led to a landmark ruling, but the appeal judge said the council had not acted unlawfully. Mr Davey, from Burcot, is registered blind and uses a wheelchair, requires help with all of his personal care needs. He had argued the reduction was both unreasonable and unlawful. In response to the ruling, his mother Jasmine, 76, said: 'We're struggling. We're having to rethink the whole way that Luke is having his care." Mr Davey was supported by a team of personal assistants for 23 years, relying on a care package costing £1,651 a week. The council proposed reducing this to £950 a week in June 2015 when the Independent Living Fund (ILF) was closed by the government. In his written judgement, Lord Justice Bean said: "It is understandable that the claimant, Mr Davey, and other members of his family objected to the updated needs assessment, which has resulted in a substantial reduction in the level of the claimant's personal budget. "I have great respect for the manner in which the claimant, his family and his team of carers cope with his difficult situation. "But that is not the same thing as holding that the council's actions have been unlawful." A county council spokesman said: "We will continue to work with Mr Davey and his family to ensure he gets the provision of essential services he needs. "The Court of Appeal has confirmed that the Council's assessment of Mr Davey's care needs and the allocated amount for his personal budget is appropriate and lawful. "All local authorities who provide adult social care services against a background of financial constraints in the public sector are having to make difficult decisions."